Is OIRA Taking EPA to the Woodshed over Carbon Pollution Standard? Today marks three months and ten days since EPA transmitted the proposed Carbon Pollution Standard, a regulation that would effectively ban coal-fired power plants, to the Office of Information and Regulatory Affairs (OIRA) for review. The unusual delay suggests that EPA’s signature climate policy is enduring the bureaucratic equivalent of a spanking. And if OIRA indeed is taking EPA to the woodshed over the agency’s flawed Carbon Pollution Standard, there’s a distinct possibility that the rule might change significantly when it is (finally) published in the Federal Register. OIRA was created by the Congress with the enactment of the Paperwork Reduction Act in 1980. At the time, the American public was wary of intrusive government regulations. This widespread sentiment (best captured by pop culture in the form of Walter Peck, pictured left) was in part a natural reaction to stagflation, but a decade’s experience of the Great Society getting mugged by reality also played a big role. In this political context, OIRA’s broad mandate was help alleviate the paperwork burdens imposed by the federal regulatory state on American businesses and private individuals. In 1981, President Ronald Reagan substantially increased OIRA’s authority with the promulgation of Executive Order 12291, which required that federal agencies submit their proposed and final regulations to OIRA for review. Thus, OIRA became a primary means by which the President could affect regulatory policy. President Clinton updated the terms of OIRA’s regulatory review in 1993 with the issuance of Executive Order 12866. The two Orders did not engender materially different procedures. The exact authority exerted by OIRA’s regulatory review is somewhat murky. OIRA’s mandate, according to its authorizing executive order, is to review “significant” agency regulations, in order to ensure that they are consistent with the “applicable law” and “the President’s priorities.” The Office’s power is limited to returning flawed regulations to agencies, which must then reformulate the measures, presumably to better comport with “applicable law” and “the President’s priorities.” Yet Congress usually delegates regulatory authority to specific agencies, not to a certain agency AND the Office of Information and Regulatory Affairs. A Congressional delegation of rule-making authority is not akin to a “plus one” party invitation that affords the White House the opportunity to add a second rule-maker to an existing regulatory regime. It follows that if OIRA’s input were to alter the substance of a regulation, which it almost certainly does, such influence would likely be an impermissible encroachment on the exclusive regulatory power delegated to the agency in question. Nonetheless, the legal authority of OIRA’s regulatory reviews remains unclear, due to the simple fact that OIRA’s input is shrouded in secrecy. Rare is the instance when OIRA’s draft comments during regulatory review are leaked to the public. Even in the case when OIRA’s input becomes public knowledge, it’s still extremely difficult, if not impossible, to prove that OIRA’s unduly influenced the rule. (A regulatory agency must be afforded the discretion to speak for itself, so as long as the agency head does what the White House asks, there’s no way to prove that OIRA was the cause of any aspect of a final rule). Putting aside for a moment OIRA’s utter lack of transparency, there is ample reason to believe that OIRA is scrutinizing EPA’s proposed Carbon Pollution Standard. The rule would require new coal-fired power plants to install a technology, known as carbon capture and sequestration, that collects greenhouse gas emissions from the smokestack and then pipes them into underground geological formations, where they are stored for the long term. The technology looks great on the drawing board, but it’s never been commercially installed on a coal-fired power plant. From a legal perspective, whether or not carbon capture and sequestration is “commercially viable” is a crucial matter. If the technology is not market ready, then it is an illegal basis for the Carbon Pollution Standard. To be sure, EPA maintains that carbon capture and sequestration is adequately demonstrated. And the agency defended this claim in the Carbon Pollution Standard. However, in the three months and ten days since the regulation was sent to OIRA for regulatory review, EPA’s finding that the technology is “commercially viable” has been cast in doubt. For starters, an EPA Science Advisory Board work group on November 12th issued a memorandum calling for the full Board to vet the science behind EPA’s finding that the Carbon Pollution Standard is based on commercially viable technology. The work group in particular questioned EPA’s claim that its justifications has passed peer-review; the memorandum asserted that EPA’s peer review process “appears to be inadequate.” Under political pressure from EPA, the SAB work group effectively withdrew its request, although it did not disavow its original claim. Two days later, in a November 15th letter to EPA Administrator Gina McCarthy, Reps. Fred Upton (R-Michigan), Ed Whitfield (R-Kentucky), Joe Barton (R-Texas), and Steve Scalise (R-Louisiana) brought to her attention a little-known provision of the 2005 Energy Policy Act that prohibits the agency from basing an “adequately demonstrated” determination on carbon capture and sequestration projects that received subsidies pursuant to the law. As they helpfully note, EPA relied on three such pilot projects to justify its determination that the technology is market-ready. Much of the agency’s evidence, therefore, is arguably an impermissible foundation for the Carbon Pollution Standard. There’s more! As I explained in a September 27th legal analysis of the Carbon Pollution Standard, the proposed regulation fails to account for the air quality impacts of carbon capture and sequestration—namely, that the regulation would directly result in an INCREASE of greenhouse gas emissions, the very “pollutant” the regulation is intended to control. This inconvenient truth renders the regulation plainly contrary to its authorizing statute; after all, only an absurd regulation exacerbates the problem its meant to mitigate. Finally, the American Public Power Association, in a December 9 letter, warned that EPA’s Carbon Pollution Standard impermissibly ignored the potential unintended environmental consequences of carbon capture and sequestration unrelated to air quality. To be precise, the letter alleges that EPA impermissibly failed to address the potential of water contamination caused by CO2, an acid gas, being stored underground in proximity to aquifers. So…EPA’s Carbon Pollution Standard is being made to look foolish. Enter OIRA, and its regulatory review. More than three months have passed since the process began. While it’s impossible to know for sure, it stands to reason, given the delay and the above listed concerns about the rule’s consistency with “applicable law,” that OIRA is raking the regulation over the coals, which would be a welcome occurrence. It’s important to note that none of this blog post should be taken to condone OIRA in general. On the one hand, I’m uncomfortable with the Office’s aforementioned secrecy. On the other, I desire a more effective restraint. 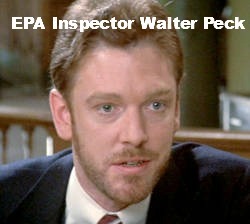 OIRA is clearly an imperfect check on agency action, as is evidenced by the fact that Obama’s EPA has prosecuted a war on coal with a series of senseless rules and regulations that serve no purpose other than the rewarding of the President’s green base at the expense of a politically incorrect industry. It can thus be presumed that OIRA’s regulatory review most often merely nibbles around the edges, rather than confronts EPA’s zealotry head-on. Common sense is sacrificed to politics. And yet, there does seem to be a degree of agency excess that OIRA cannot countenance. I know of one such example. In the spring of 2010, the Office conducted a regulatory review of EPA’s proposed regulation to control coal ash and other byproducts of combusting coal to generate electricity. The agency’s coal ash rule was, in a word, egregious. It treated coal ash, which is a primary ingredient in cement and road-making materials, as if it was a toxic waste. In so doing, the regulation would price a number of existing coal-fired power plants out of the electricity market–the intended action–but also end the substantial market for coal ash recycling. EPA accidentally published a version of OIRA’s regulatory review of the coal ash rule (available here), thereby allowing a rare glimpse into OIRA’s thinking process. It makes for interesting reading. In a nutshell, OIRA shits all over EPA’s proposal. We can be sure that OIRA’s input had an impact, because EPA reissued a starkly different proposal. (As noted above, proving this influence is an entirely different matter). I suspect that OIRA was emboldened by the overwhelming opposition to EPA’s coal ash proposal. Other federal agencies, including the Departments of Energy and Transportation, also commented negatively (very negatively) on the regulation during an interagency review process. Perhaps more importantly, officials from a large, bipartisan group of states (ranging in political orientation from Oklahoma to Illinois), were known to oppose EPA’s original coal ash proposal. EPA’s proposed Carbon Pollution Standard is as terrible as the original coal ash rule. And it seems to me that opposition to the Carbon Pollution Standard is accumulating in a fashion similar to that which mounted against the coal ash rule in 2010. Of course, it’s not shocking that Republicans would oppose the basis of this regulation. But the doubt about the rule expressed by members of EPA’s Science Advisory Board is an entirely different matter; they’ve no axe to grind. And the American Public Power Association’s evident opposition is further telling; APPA’s membership is primarily progressive-minded municipal utilities. These indications give me hope that OIRA is putting the Carbon Pollution Standard through the wringer. Ideally, the Office would humiliate the agency, as it did over the coal ash rule, and thereby prompt EPA to issue a less unreasonable regulation (at the very least—in a perfect world, the agency’s entire, misguided climate regulatory regime would be wiped from the books). If OIRA’s job is to determine if a regulation is in accordance with the law, could their lawyers just disagree with the original court ruling allowing the EPA to regulate CO2? It seems like their mission can conflict with the courts. Hi Scott, Thanks for responding. The answer is, I think, that the distinction between an “OIRA” legal analysis, as opposed to an “EPA” legal analysis, is paramount. However, I also think this distinction is moot. If the agency says OIRA didn’t influence its decision, then the matter is said and done. DISCLAIMER: I’M OPEN TO BEING PROVED INCORRECT! Missing the important point that the basis for punishing CO2 emitters is an unproven/ disproved hypothesis. Previous post: Supreme Court Global Warming Case: Does EPA Permitting of Greenhouse Gases ‘Deform’ the Statute?